Korean Air unveiled its brand-new Boeing 787-9 Dreamliner at Incheon Airport. Walter Cho, President of Korean Air, was present at a ceremony at the Korean Air hangar to unveil Korea’s first Dreamliner to the public. The aircraft, which Korean Air is introducing, will provide a whole new experience for passengers. 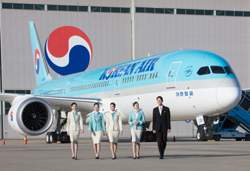 Korean Air plans to utilise the aircraft for long-haul routes with high demand for leisure travel. First, the airline is scheduled to launch domestic flights between Seoul’s Gimpo Airport and JeJu Airport for a month as part of the required certification period, before launching long-haul international routes from Seoul’s Incheon Airport to Toronto, Madrid and Zürich later this year.